Identify the visible and invisible community leaders who, by virtue of experience and commitment, hold the history, present and future vision of the community. 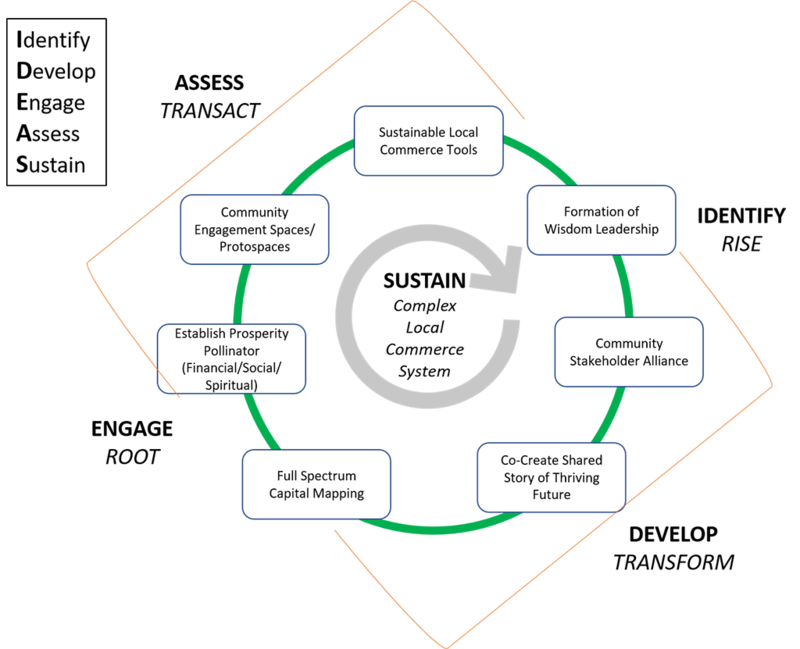 A community stakeholder alliance is an idea exchange. It is both an incubator and an accelerator of new ideas, a forum for people, groups, organizations and businesses that have interest or concern in the community. Stakeholders can affect or be affected by the community's actions, objectives and policies. Work with the Wisdom Leaders and the Community Stakeholders to rewrite the story of their shared future in which their values are fully expressed in the context of shared well-being. A “pollinator” is a self-financing enterprise committed to advance the values established/identified in the community story. This prosperity is not limited to the financial, it's also inclusive of social and spiritual prosperity, as defined by the community. Ranging from co-working to SLOW [Sustainable Local Organic Work) Tech accelerators to entire communities, these spaces provide places for all community members to bring forward the parts of their story that are ready to be told. Wealth is more than money. Wealth is created when all capital forms -- monetary and non-monetary -- are brought forward, valued and activated for the purpose of the shared well-being of the community. Non-monetary capitals include, but are not limited to, environmental, trust, relationships, human, labor and materials. Combined with the transformative capitals of awareness, empathy and wisdom, the potential for a thriving community is made real. With the extended capital forms defined and valued, the local commerce system can be reformed and activated to reflect the community story of a thriving future. Work with existing and emerging technology to emerge the community's story of a thriving future.